They usually start each day with a team practice at Middlebridge, on the water by 6:00 a.m. and off to class by 8:00. But on Sunday, November 13, the URI Rowing Team put aside their oars, grabbed shovels and wheelbarrows, and spread 25 cubic yards of sand on sections of the Canonchet Farm Trail, making for a safer, more enjoyable trail for an autumn walk. And as they worked, the team spread smiles all along the trail. Click a thumbnail below to enlarge the picture. Many thanks to the volunteers. Go Rhody! Canonchet Farm is a green space unlike any other in Rhode Island. 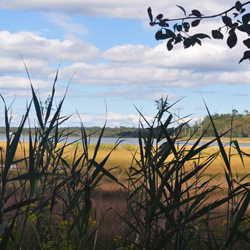 Comprised of 175 acres of fresh and salt water wetlands, forests, brooks, and ponds abutting Pettaquamscutt Cove on Narrow River, the land is habitat for a wide variety of birds, plants, animals, and insects. The original open fields of farmland have, over the years, grown into a thick forest of native and invasive plants and trees. Over the years various citizens groups such as the Narragansett Tree Society and the Boys Scouts developed over 1.5 miles of trails through the Farm, enabling visitors of all ages to experience up close the natural beauty of the farm and learn more about its unique history. 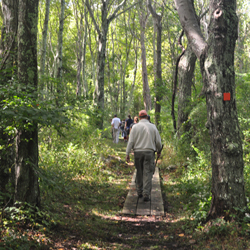 Today the trails are maintained by the Friends of Canonchet Farm. With easily accessed walking trails and proximity to the South County Museum, Canonchet Farm is a perfect venue for a day's outing. The trails are open to the public year round every day from sunrise to sunset. You may also want to join us on one of our popular guided walks, led by experts in the fields of nature, culture, and the sciences. 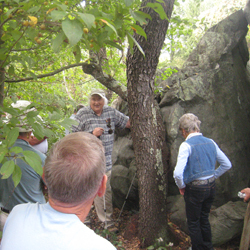 Step onto the Canonchet Geology Trail to explore the rich geologic history of the Pettaquamscutt Watershed, where glaciation deposited large boulders (glacial erratics) and carved a "Roche Moutonnée" and other features on Canonchet Farm. You will also see stone walls, stiles, a quarry and other evidence of early agricultural development. 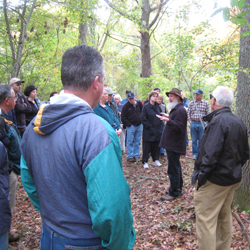 The Geology Trail was developed by the Friends of Canonchet with the help of the late Jon Boothroyd (shown to right leading a walk on Canonchet in 2010), a noted field geologist and a Research Professor Emeritus in the Department of Geosciences at URI. The trail uses sections of the main walking trail and a spur that offers a spectacular view of Pettaquamscutt Cove. After Jon's death, a geology at URI developed a map and educations materials. Download an Activities for Children on the Geology Trail. View the Teacher's Guide to activities on the Geology Trail. There will be no trail maintenance work this Saturday, November 12. The next trail maintenance work session will be on Saturday, November 19 from 9:00 to noon. In 2016, the Friends of Canonchet Farm took responsibility for maintenance and improvement of the trails through Canonchet Farm. 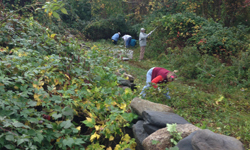 In addition to regular maintenance activities such as mowing and removal of storm debris, volunteers are removing invasive vegetation on the trails and promoting the growth of native species, an extension of our work along Lake Canonchet and Little Neck Pond. With arrival of fall, invasive remediation sessions around the coastal ponds are over for this year and we turn our attention to Canonchet Farm Trail maintenance as soon as possible to get as much done before bad weather interferes. For 2016 work sessions are on Saturdays from 9 a.m. to noon from October 8 through to the end of the year (weather and holidays permitting). Please plan to meet near the animal pens on the South County Museum property, at the end of Strathmore Street in Narragansett to pick up tools, and go to the selected work area. We may be headed into new territory - new privet to extirpate, new strangler vines to cut out, more stone walls to uncover. Or maybe we will do a quick refresh of the work started last year. Instruction, coffee, water, snacks, tools and gloves will be available. Hope to see you there! 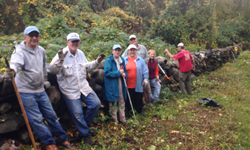 Visit the Habitat Restoration page or call 401 783-3951 for more information.